A 56-year-old Parisian woman is suing the French state for failing to protect her health from the bad effects of air pollution in Paris. Clotilde Nonnez, a yoga teacher who said she has lived in the Country's capital for 30 years claims that her health deteriorated. She said she increasingly suffered from respiratory problems, ranging from chronic asthma to pneumonia. According to her, it became worse than ever when pollution in Paris hit record levels last December prompting her existing bronchial condition into acute pericarditis attack. Speaking to France Info website, she said: "The doctor treating me says Paris air is so polluted that we're breathing rotten air. She has other patients like me, including children and babies too. My cardiologist says the same,"
Her lawyer, François Lafforgue confirmed the legal action against the state, saying: 'We are taking the state to task because we think the medical problems that pollution victims suffer are as a result of the authorities' lack of action in tackling air pollution, He told Le Monde newspaper. 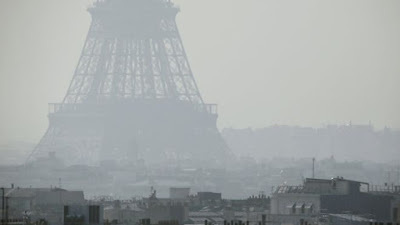 Lafforgue said air pollution is causing 48,000 French deaths per year, adding that more cases would be brought in the coming weeks, in Lyon, Lille and elsewhere.